Writing a six chapter book is an amazing accomplishment for a young student. In recognition of your student’s hard work and dedication, consider holding a winging ceremony. Question: What is a winging ceremony? Answer: In the tradition of the armed forces, after completing and passing all aviation classes, a student earns the right to wear pilot wings on their uniform. A winging ceremony is where the new pilot receives his/her pilot wings. The commander hands the wings to a family member, who pins the wings onto the recipient’s uniform. Question: What is a HTHL winging ceremony? Answer: In the tradition of Here to Help Learning(HTHL), when a student completes the Write A Book project (Flight 3 Launching Essay Writing), the new author earns the right to wear the HTHL Writing Wings. The principal of your homeschool (Usually Dad) or a Co-Op teacher hands the wings to a family member who has helped the student (Usually Mom), who pins the wings. Question: Where can I purchase HTHL Writing Wings? 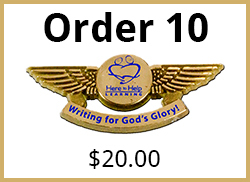 Answer: HTHL Writning Wings can be purchased in the Resource Store or by selecting an option below. 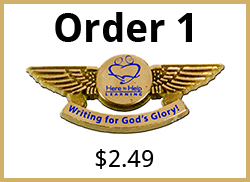 HTHL Writing Wings are sold individually for $2.49 each, or $2.00 each in a pack of 10. Question: Do you have an HTHL Write A Book Project Certificate of Achievement? Answer: Yes, beautiful printable certificates are available to download and print right here! Preview the certificate below, and click the printer icon to send the certificate to your printer. Question: Will Mrs. Mora come to the winging ceremony? Answer: Mrs. Mora may be available depending on her speaking and convention schedule. She LOVES winging ceremonies. Please contact beth@heretohelplearning.com to submit your request. Here To Help Learning is a proud partner in your student’s writing accomplishment. Please send us your winging ceremony pictures to share. We have a special HTHL wall dedicated to “winging ceremony pictures”. Send pictures to contact@heretohelplearning.com or post them directly to Here To Help Learning’s Facebook page.